Carmenita Truck Center has the best selection of New, Used, or Custom Glass Trucks! Whether you are installing glass for commercial or residential customers, we have new and used trucks fitted with racks to safely transport sheets of double glazing glass, frosted glass, pane glass, window glass, door glass, and more. 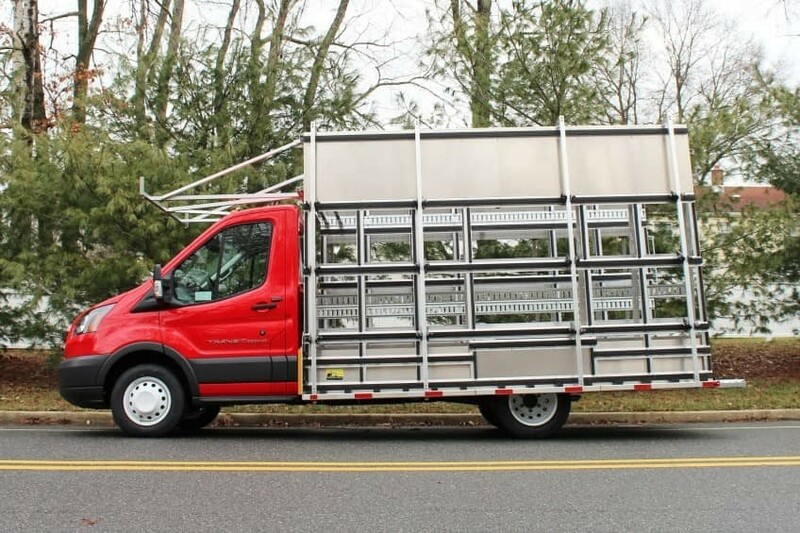 We carry Ford, Hino, and Mitsubishi Fuso and can outfit any of these manufacturers with racks. 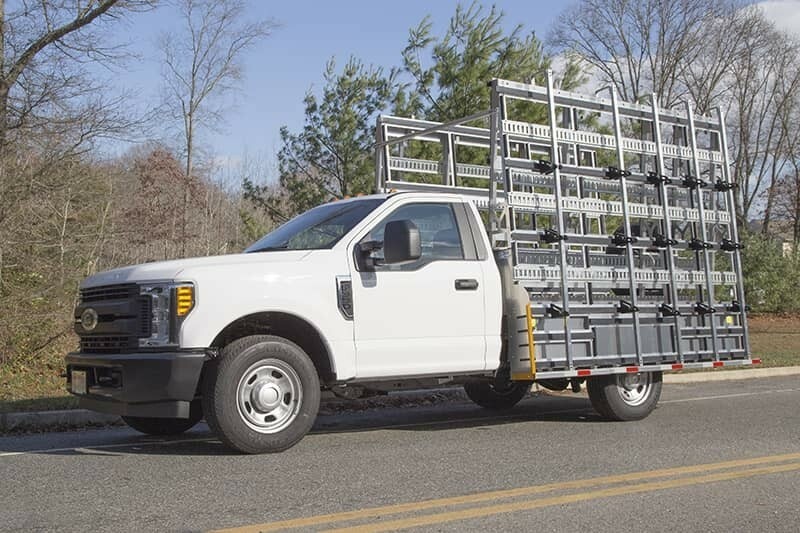 10′ wide x 8′ tall Glass Rack with Four Cross-Bar Roof Rack by MyGlassTruck.com, America’s Glass Rack Leader; Best-in-Class 1,000 lb. Weight Capacity; Built for durability and longevity from T6 Aluminum Slats and Posts with Huck® Aircraft Grade Fasteners which are superior to welds or nuts and bolts for joining aluminum; Features full-length horizontal and vertical rubber Glass Protection Padding – the most in the industry; 5″ deep, fully-usable bottom Glass Support Ledge with 1.25″ thick Rubber Block Pads, Dual Pole Settings and a padded, Removable Front Stop; Removable Wheel Skirt for easy access to wheels. Three Glass Securement Poles with five adjustable black Neoprene Cleats each. 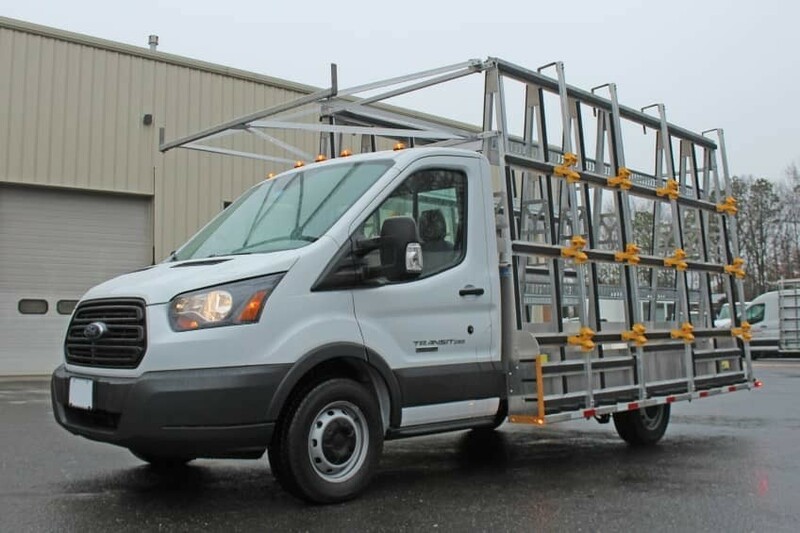 8′ wide x 7′ tall Glass Racks on driver and passenger sides by MyGlassTruck.com, America’s Glass Rack Leader; Best-in-Class 2,000 lb. Weight Capacity (1,000 lb. per side); Built for durability and longevity from T6 Aluminum Slats and Posts with Huck® Aircraft Grade Fasteners which are superior to welds or nuts and bolts for joining aluminum; Features full-length horizontal and vertical rubber Glass Protection Padding – the most in the industry; 5″ deep, fully-usable bottom Glass Support Ledges with 1.25″ thick Rubber Block Pads, Dual Pole Settings and padded, Removable Front Stops; Removable Wheel Skirts for easy access to wheels; All required Marker Lights; Six Glass Securement Poles with five adjustable black Neoprene Cleats each. 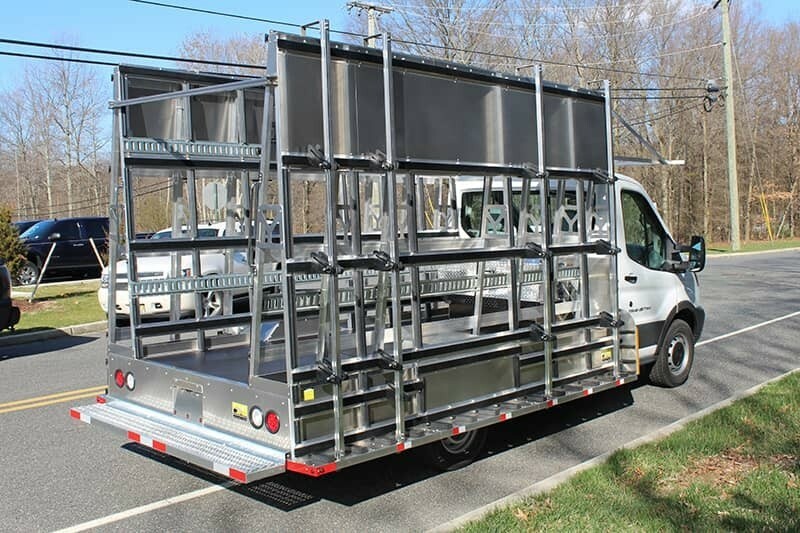 14′ long Glass Transport Body by MyGlassTruck.com, America’s Glass Rack Leader; Best-in-Class 10,000 lb. 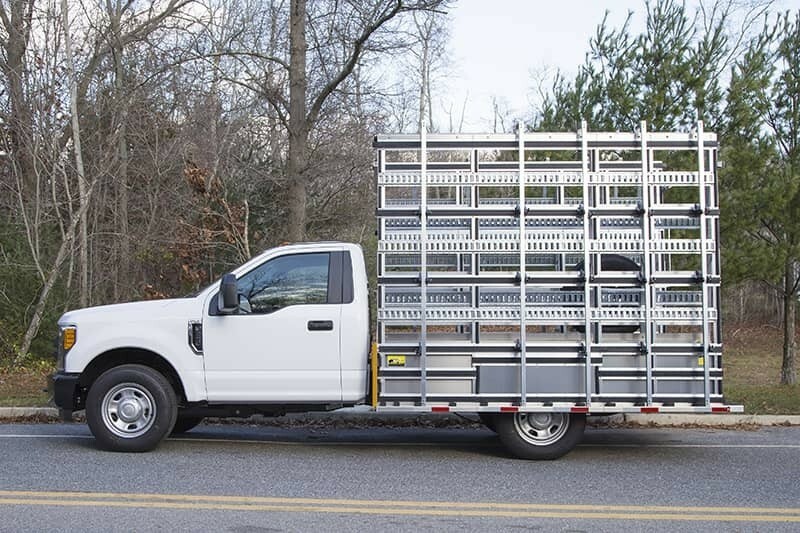 Weight Capacity; Welded, Painted Steel Sub-Frame provides Strong Support for Aluminum Truck Body; Body’s exterior features 9′ tall Aluminum Glass Racks on driver and passenger sides, 5″ deep, fully-usable Bottom Glass Support Ledges with 1.25″ thick Rubber Block Pads, Removable Front Stop; Rear Step Bumper and Stirrup Steps; All LED Lighting with Sealed Wire Harness; Removable Wheel Skirt; Interior features two 7′ tall Aluminum Glass Racks on both sides and Slip Resistant Floor. 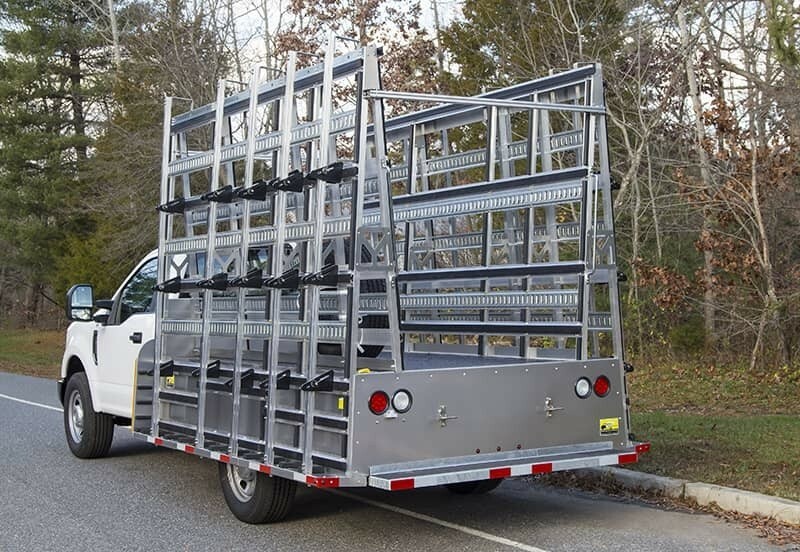 Includes Full Length Horizontal and Vertical Rubber Padding; Storage between Inner and Outer Racks; 10 Extra-Tall Glass Securement Poles with six adjustable black Neoprene Cleats each. 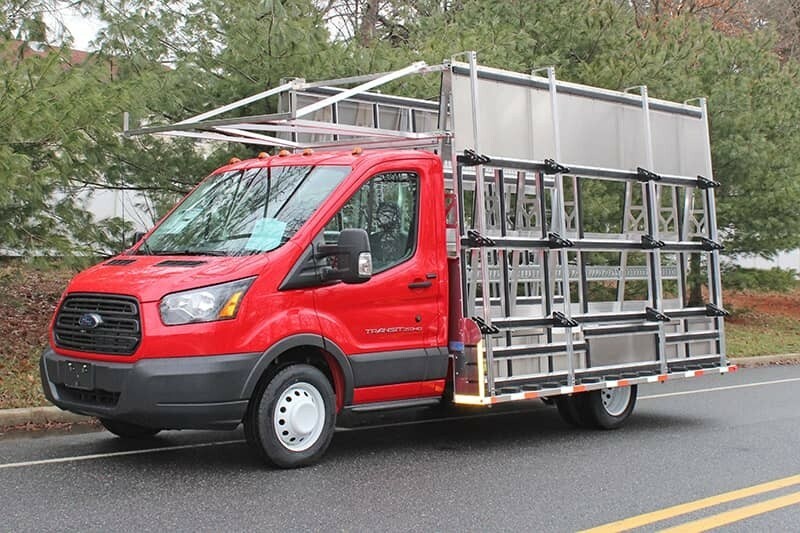 Optional E-Track, Sign Panel and over-the-cab Metal Carrier available.